Being a mom is hard work. Motherhood is arguably one the most stressful jobs in the world. This doesn’t just go for human moms — these statements stand true across all species. Even dogs. Being the mother of rowdy, hyperactive puppies is tough. Their energy level is off the charts. So, as a mother, you have to get creative in how you wear them out. 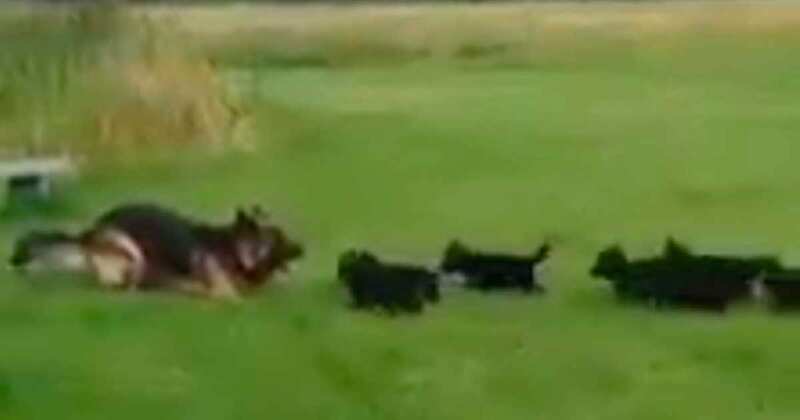 The German Shepherd in the video below is a wonderful mom to her precious puppies. She knows that her babies are giant balls of energy, and if she wants to rest later, she’ll have to make sure they’re tired. 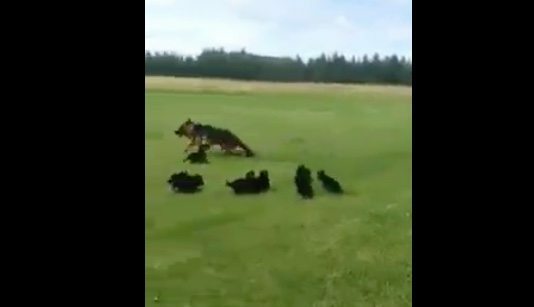 Being a great mom, the German Shepherd decides to take advantage of some playtime in an open, grassy field with her puppies. She begins to run around, encouraging them to chase after her. Like the Shepherd she is, she runs around her babies, herding them into a circle, then taking off again. Playfully tuckering her puppies out. 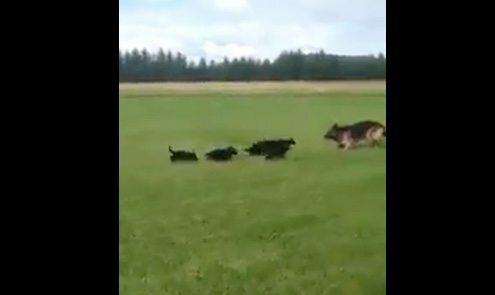 The beautiful dog lovingly runs around her kids as they try to keep up. Their little legs are so small that they’re having a tough time catching their mom. It’s a sweet little game of tag that she plays with her adorable pups. The owner that is filming the precious moment can’t help but let out a giggle every now and again. It’s too cute not to react. The little dogs’ legs are moving as fast as they possibly can. Mom does circles around her adorable furballs as they yelp in excitement to try and catch her. 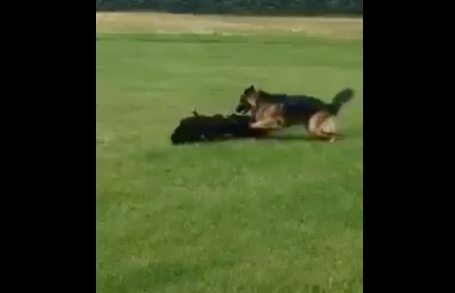 After a while, the German Shepherd stops and takes a quick second to let her kids gather around her. But just when they think they’ve reached the end goal — mom takes off again! She wasn’t done wearing them out quite yet. Toward the end of the video, the owner mentions that the dogs are starting to look tired. It looks like mom has done a great job of expending some of her puppies’ energy. It’s safe to say that the little babies slept very well that night. The sweet moment was caught on video, and it couldn’t be more adorable. It’s evident that she’s a wonderful mother!